Our wacky summer weather continues into our fall. After having a lovely few days of cooler, autumnal feeling weather, the last two days have been full of humidity and heat. I know I shouldn't complain about our weather, though, considering what all the folks on the southeastern coast of our country are facing. This is a time we hope the weather people are wrong about their predictions and the severity of the hurricane will not materialize. I crossed another big one off my To Do List today. Pulling, processing and getting the beets from the garden into the freezer was accomplished. Slow learner that I am, I've finally realized we don't need a full 4' x 8' raised bed of beets for the two of us. Plus, giving up making any pickled beets this year seems wise as I'm the only one who enjoys them. This year I planted only two eight foot rows of beets and after the harvest was completed today I'm confident that is enough. For the last several years I've planted only the Forono variety of beets as the long, cylindrical shape makes it easy to slice up into proper sized pieces. This bowlful pictured above weighed fourteen pounds and I had another bowl of the same size. 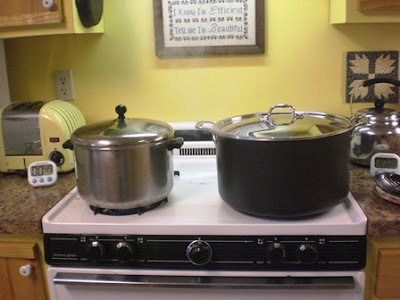 I sorted the beets by size and cooked them in two pots, one for medium sized beets and one for the larger ones. Made a bloody messy mess of the kitchen (if you've ever processed beets you know what I mean), and when all was said and done, I put thirty-three servings (a serving being a meal for two people) in the freezer. 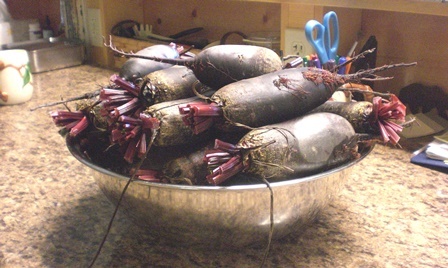 I saved a bag of the raw beets to use for grated beet salads and roasted beets. With all the other veggies stashed in the larder, we aren't going to be lacking for vegetables on our plates this winter. The only one to do yet is the Brussels sprouts. 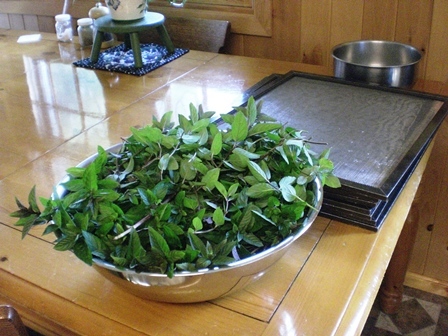 After I swabbed up from the beet processing, I took what I think will be our last cutting of mint for this year. 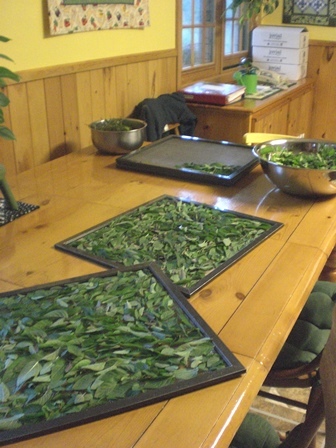 I like to have eight full trays (the capacity of our dehydrator) when I dry anything. Wouldn't you know it, I had only seven trays full and I think there just may be enough left out in the mint bed for one more tray. But when I got that far tonight, it was already dark and I didn't have the gumption left to put on my headlight and go cut more. The trays already done will wait in the dryer over night, and I'll finish up that last tray first thing in the morning. Switching topics, on the automotive front, we just had four new tires mounted and some work done on the brakes of our Suburban so tomorrow we're planning on taking it out for a test drive to see that all is A-OK now. Our fall color season seems to be a bit slow in arriving this year, but we'll do some scouting on our drive to see if we can spot some color. Who knows, maybe we'll stop somewhere for lunch . . . somewhere not in Mama Pea's kitchen. You must of posted this after hours as it appears I am the first. Yippee! I always preferred to process beets when they were smaller, easier to use. I did my last batches about 2 to 3 years ago and I am still on occasion popping a top on one of the pints. I know what you mean about the massacre effect it has on the kitchen. Funny thing is when I had a part time job at a local fabric store my on farm efforts were easily recognized at work the next day. If my fingers hung onto the remnants of almost burgundy my co-workers say "ah been canning beets?" If they had a green appearance the response was " tattooing goat kids yesterday?" Amazing how dyed nails can give you away. Hope the Suburban is running like the proverbial top. One of our 4H families with 8 children had one . It was a great vehicle and last I knew it was still running . They seem to last forever. Love your new header. I love pickled beets, I'm the only one that eats them. How do you fix your beets after freezing them? . I'm going to try the cylindrical beets next year. Goatldi - Well, admittedly my beets are usually harvested and processed when they are smaller, too. But what can I say? Other projects kept getting in the way and da beets just kept growin' like Topsy!! I kept a serving out for dinner last night and am happy to report they were mild, lovely textured and yummy! Whew. Back in the day when I was working for a big company, I spent the weekend canning applesauce and making apple pies for the freezer. These particular apples stained my hands and fingernails a dirty gray. On Monday morning at work, my boss caught sight of my hands and gasped, "My gawd! What happened to your hands?!" You're right about Suburbans. Ours is '93 and our mechanic loves it because he says it's so easy to work on. May it live forever!! Anonymous - Thank you! We should get together to share jars of pickled beets! To serve the beets, I bring a small amount of water to boil in a saucepan, plop in the frozen beets, bring water back to a boil and let the beets boil briefly . . . maybe only 2-3 minutes. Since they're really already cooked, you just need to heat them through. When you said beets, I thought of _MESS_! ,-))))) What gorgeous dye they must make. Same here, heat back again. wisps of words - Yes, several times yesterday during the beet operation I couldn't help but think of the dyeing possibilities from beet "juice." Our "day out" will only be a couple hours after lunch, probably. Also, hubby says since he drove the Suburban the 17 miles home yesterday he doesn't really feel it needs more of a "test drive." Sigh. But when I told him what I had on my mind to accomplish while taking the test drive -- bank, recycling, dump, milk run -- he said that made sense. So we'll see how the day progresses! Don't you just love getting lunch out? I get so excited when someone ELSE will fix my food. Even if it's just a sandwich! I see those beets and all I can think of is kvass! Oh and pickled. Definitely pickled. I am not a fan of warm beets. Thank you for your full-of-wisdom comment, on my post today. Thank you very much. As I said, I was torn, so I got that "off my plate" so to speak. And as I said, I will go on regularly, now. Thank you again, for weighing in, on this topic. SmartAlex - Boy howdy did you ever hit it on the head! Just eating food that you didn't have to prepare . . . what a treat. Sitting down, having someone bring the food to you, eating and then walking away. Yep, a treat! Doesn't like pickled beets? Did you know that before you married him? I like the cylindrical beets, also. Pickled is our preferred method of eating so I freeze very few. We eat a lot when we cook them up for pickles but not to put in freezer. Phil - I think you'd like the Forono beets if you try them. I've never had them get woody or bitter. Test drive went fine . . . as my husband said it would. Ha! Athanasia - Yep, apparently that was one question I forgot to ask him. ;o] I'm always surprised at how many folks don't like plain cooked beets (with butter and salt!). Although I never had them until I was married and started to grow them myself. You sure don't see them in the frozen vegetable section in stores like other vegetables! "Bloody Mess" Yes...I know that! LOL...I would love to grow beets...it's in the future plans. I think that I've had the most success with root veggies. Oh by the way I LOVE your toaster!!! :) You have me thinking that down the line I need a new dehydrator too. I bought a cheapie one about 8 years ago and it's creeky and slow at dehydrating...not like it used to be! Rain - Strangely, after making a "mess" in the kitchen, I find the clean-up to be so satisfying. Plus, there's the end product you have after making that mess! I had a reputation of killing toasters with regularity for years. Don't know why I was cursed but I couldn't keep a toaster alive for more than a year. Then years ago (probably more than 15 now) our daughter gave me this toaster for Christmas. (I have a sneaky feeling it cost about $200 -- eeep! 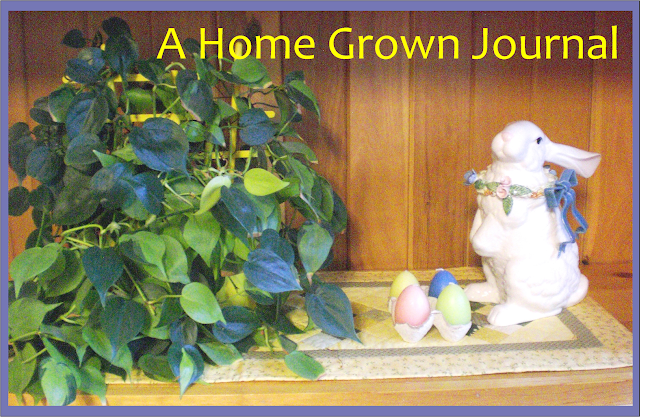 ), but it has been wonderful and just keeps on toasting so in the long run it was definitely worth it. And the look is unique, I think. If you can, find a dehydrator that isn't plastic. I mean just think of that heat out-gassing from the plastic trays and going into your food . . . not good! Ours is an old Bee Beyer with stainless steel trays and hopefully will last us forever. Papa Pea did replace a small part in the heating element a couple of years ago, but I've put tons of food through it in all the years we've had it.